I am proud to have been a member for 20 of the Legal Marketing Association's 30 years, and I'm especially proud to have served its 3,800 members as the 2014 President. As my time in the spotlight concludes, I am delighted to leave the organization in the capable hands of the many smart, passionate, dedicated legal marketing professionals who comprise the next generation. Many don't recall a time before there was an LMA, and they don't know the challenges the founders and early leaders faced gaining traction. Nor should they. The future leaders and members of LMA will face their own challenges advancing and expanding the profession and the association to meet the rapidly evolving needs of the marketplace; challenges that they are uniquely equipped to tackle. I am grateful for the significant efforts of those who preceded me, and I hope in some small way my efforts, and those of the extraordinarily capable Board members, volunteers, and staff who served with me, have improved LMA. Many thanks to 2015 President Adam Severson and Executive Director Betsi Roach for producing this history of the Legal Marketing Association. In a few short weeks I take the helm as President of the 3,400+ member strong Legal Marketing Association. I could not be more proud to have been elected to lead LMA, a family in which I have been actively involved for nearly 18 years. Just as each of my esteemed predecessors has faced a fast-moving marketplace, I too step in during a time of great change. I'm quite fond of change, however, and I strongly believe the enormous structural and financial changes taking place in the legal marketplace are good for the legal profession, and provide an excellent growth opportunity for the legal marketing profession and the Legal Marketing Association. 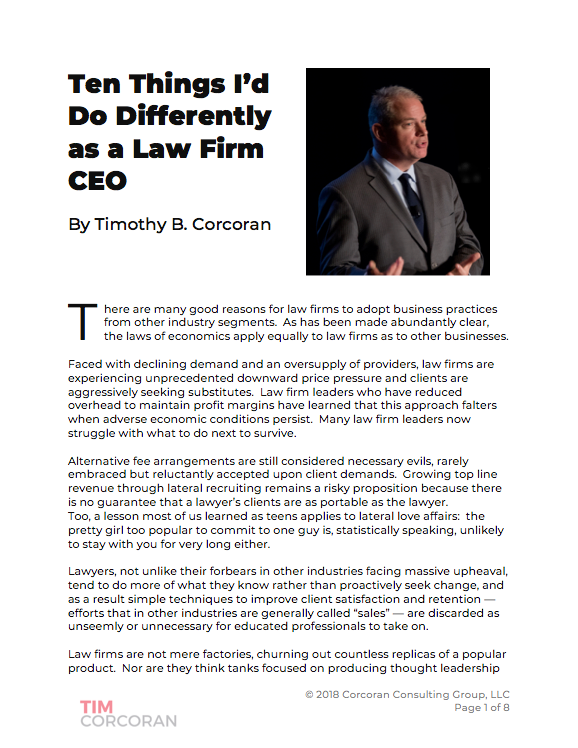 The current and outgoing Legal Marketing Association president, Aleisha Gravit, conducted a short Q&A with me in her final column of Strategies, LMA's flagship publication, in which I conveyed my outlook for the organization in 2014 and where the legal marketing profession is headed. Q. Tim, as incoming president, what are the primary goals for LMA in 2014? A. We must continue to improve both the quality and the access to education for all members, so expect to see more movement on that front. in 2014, we will pursue with vigor new opportunities for collaboration with and among chapters and city groups, so good ideas can receive a wider audience, regardless of where they’re developed. Q. What trends are you envisioning in legal marketing during the next five years? Q. What advice would you give someone just starting out in legal marketing, say with less than two years of experience? A. Do not allow yourself to be boxed in by how earlier generations of legal marketers have defined the role. Each successive generation must continue to push the boundaries. Q. On the flip side, what advice would you give seasoned legal marketers? A. Seasoned marketers who have earned the trust of their internal clients often have the latitude to master new skills and tackle new challenges. while our world is evolving, our own skills can also evolve. Introducing new ideas to tradition-bound lawyers is challenging, but who better to carry the torch of change than trusted marketers who have learned and embraced and adopted new ideas? Q. On a more personal note, what do you do in your spare time? A. I play a lot of basketball. But my real avocation is raising my two daughters. whether it’s attending their sporting events, attending concerts together, trying new recipes or just enjoying their presence, being a Dad is my favorite activity.